Flatwall Bianco Brown: 40x40 DL-BBR - Tile Series, used against a straight wall. Diamond Hearths hearth pad are hand crafted in America by skilled craftsmen. The founder and principles of Diamond Hearths together have over 20 years in the hearth pad business. Their attention to detail and insistence on quality and workmanship are evident in every hearth pad that Diamond Hearths produces. Diamond Hearths uses only the finest quality materials sourced from around the world. Every hearth pad is repeatedly checked for workmanship and quality before it leaves their facility. Diamond Hearths pads are skillfully assembled with color coordinated components to highlight the beauty and décor of any room and heating appliance. Diamond Hearths uses only the highest quality super thin-sets and grout to insure permanent tile and slate bonding. 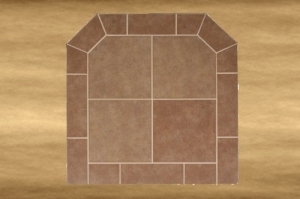 This critical aspect of hearth pad construction insures our hearth pads beauty and durability. Additionally each hearth pad is made with a durable angle iron frame to protect its craftsmanship and beauty during shipment and installation. This assures that your investment in a quality Diamond Hearths pad will last. Diamond Hearths pads have been tested and approved by an independent laboratory to meet and exceed UL-1618, UL-127, UL-737, UL-1482 and NFPA-211 certification.